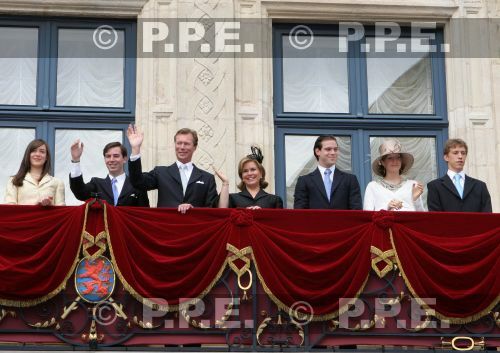 13-05-2007 Tessy de Nassau, apparently pregnant wife of prince Louis, at the procession of the closing of the Octave of Our Lady of Luxembourg. On this photo she looks like she is but is there any official announcement? She certainly does look pregnant again! I am really surprised they had another so soon but congratulations anyway! Where were these pictures taken? Were any other royals present? Is this an official duty for Tessy? I believe Sebastien wasn't present, the other members were. I know that her first pregnancy was announced by the court/press release(? ), but would this one be? Isnt Louis & Tessy no longer of the royal house, is they are then i dont think we will get an announcment, since last announcment Louis was still part of the court/royal house. Tessy is IMO stunning on these pics. She does look pregnant, but could it be the style/print of that dress that makes her appear pregnant? Yes she is. When I first saw her pictures (around the christening of the first baby) I didn't think she was cute at ALL. She's very pretty here. I hope she's pregnant, but who knows, she may have just gained a little weight. is there any offcial anouncement<? Not really. If she is indeed pregnant its kind of like Mary & Letizia. They announced their pregnancies right around their children's 1st birthdays. Gabriel just turned 1 a few months ago. I remember hearing somewhere that generally there is an 18 month time span between births. if this is true, and judging by that picture, it certainly seems so, than congratulations to Louis, Tessy, Gabriel, the Grand Duke and Duchess, and the rest of the family! Gabriel seems so cute, and adored (especially by his grandmother! ), and I hope the next baby is the same. **edit: by looking at Princess Robijn's first picture again, (the 45 degree angle to the side shot) there is no way that the dress could make her appear pregnant to that degree. The material is clinging to her, especially to her legs, and the wind, if there is any, seems to be headed at her front. Ohhhh, a little brother/sister for Gabriel! Is she wearing a hat because she's married? Wonderful news (if its true). I wonder if the Grand Duke and Grand Duchess are excited about having a second grandchild. Its better to have loved & lost then to have never loved at all.